Experience the state's best kept secret when you visit Eagle Pointe Golf Resort, located on the beautiful wooded bluffs overlooking Monroe Reservoir, Indiana's largest lake. Enjoy the many amenities on site including golf, dining, tennis, swimming, banquet & meeting facilities and condominiums available for reservation. The resort is located just 8 miles south of Bloomington and Indiana University. Play our 6,700 yard par 71 Championship golf course with 4 sets of tees for your enjoyment. Rolling hills, 2 cascading waterfalls, and over 100 sand bunkers highlight your golf experience at Eagle Pointe. Please call for tee times. Contact Golf Club at Eagle Pointe at 812-824-4040 for more information and details on holding a golf outing at the course. Contact Golf Club at Eagle Pointe at 812-824-4040. 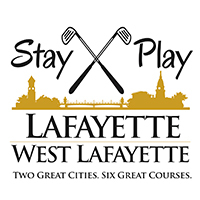 Contact Golf Club at Eagle Pointe at 812-824-4040 for onsite or nearby dining options. This profile was last updated on 03/19/2019 and has been viewed 15,503 times.